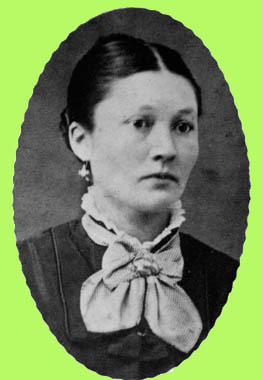 I, Anna Maria Louisa Niemann, was born in Province Hannover, Landkreis Osnabrueck on Feb. 19, 1857. I was baptized March 1, 1857 in Schledehausen by Pastor Wiesehahn. My parents were Marie Margaret Elizabeth Lauman and Johann Frederick Wilhelm Niemann. I had seven brothers and one sister. My brother, Wilhelm, died in Germany while in the army. We lived on a farm in Grambergen, which my parents owned, but as we grew up they found that the farm was too small to support all of us. Brother Wilhelm advised father to send the older brothers to America. Henry, Gerhard, Fred and August came to the United States and settled in Wisconsin. My younger brothers, my sister and I remained in Germany with our parents to help with the farm work. The threshing of the grain was done with a flail. Since all of the clothing we wore was home spun and home sewn, I learned to spin yarn and weave cloth. I almost lost my life twice during my early childhood. One day our house was afire and in the excitement my parents almost forgot me as I lay asleep in my crib. Flowing through our farm was a small stream in which we washed our clothes. While playing in the yard I fell into this stream, and again I was rescued. After my older brothers had been in America for several years, brother Gerhard came back to Germany to persuade the family to leave their homeland for America. All were willing to leave with the exception of my father. After a great deal of persuasion my parents, with Gerhard, Herman, George, Caroline and myself left Germany June 27, 1872. After being aboard ship for several weeks we arrived safely and settled on a farm which my parents purchased in Grant County near Fennimore, Wisconsin. To help with the family finance I sewed for others and worked in a hotel in Boscobel. Later I helped my brothers, who had moved to Iowa, harvest the grain. I drove the horses on the harvester, which cut the grain, but did not tie it. Two men rode on the harvester and tied the bundles. Later I returned to Wisconsin to renew my acquaintance with Johann Frederick Niewoehner. He was born in Germany at Moenkehoefen, Feb. 8, 1855. He came to America Feb. 27, 1872 and here he worked for the Wefel family. Later he went to Iowa, locating near the Niemann brothers. He returned to Wisconsin and we were married July 13, 1879 by Pastor G. Hirtz in Fennimore. After our marriage we returned to Iowa, which was a two-day journey. Our first daughter, Clara, was born in the year 1880 on the farm immediately east of the Richfield Church. When Clara was two years old she fell from an upstairs window, which might have led to her death as a young girl in 1898. Our oldest son, Herman, was born on this farm in the year 1882. Our next home was the farm north of the Richfield Church, where four of our children were born. (This farm is now owned by our youngest son, Adolph.) George was born in 1884, Adolf J. in 1886, Henry in 1888 and Martha in 1890. Our little two year old, Adolf J., fell into a water tank and drowned in 1888. Henry died in 1923, leaving his wife and four small children. Martha passed away in 1957, twelve days before my 100th birthday. We left this farm and moved to Manly, Iowa where our son, Herbert, was born in 1892. The last thirty years of his life, he made his home with his brother, August, and family, until his death in 1953. Our next move was to the farm five miles east of Fredericksburg where our daughter, Laura Kilcher, now lives. Our last five children were born on this farm. They are August in 1894, Laura in 1896, Emma in 1898, Hertha in 1900 and Adolph in 1903. In 1910, we took our four youngest children and moved to 409 Courtland St. in Waterloo. After a short time we moved to Sumner. From there we moved back to the farm north of the Richfield Church, where we later celebrated our 50th wedding anniversary. Fifteen month later, in the fall of 1930 my husband died. Until 1943, when I could no longer do my own work, I kept house for Adolph. At this time I moved to Fredericksburg to live with my daughter Martha. Today, still in the same home, I am celebrating my 100th birthday with my seven children, twenty-nine grandchildren, sixty-one great grandchildren and four great great grandchildren.